Do you have either missing teeth or teeth that are beyond repair? If so, then dental implants may be right for you. Implants are lifelike artificial teeth that enable you to eat, smile and talk naturally and comfortably. An implant is an artificial tooth root, made of titanium, which is topped with a crown, bridge or denture. Implants can be used alone or in combination with other replacement teeth, such as for stabilizing dentures or bridges, making a full-mouth reconstruction more affordable. Implants feel natural. They give you the ability to chew normally, so you can eat the foods you’ve been missing. You can talk and smile confidently. Dental implants raise the overall quality of your life. Dr. Alidadi has extensive experience with dental implants. 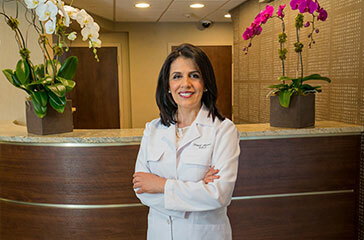 Dr. Feryal Alidadi has taken extensive advanced training and has over a decade of experience placing dental implants. This includes a year-long program on implant procedures at the renowned New York University, the largest private university in the United States. Dr. Alidadi will guide and co-manage your implant treatment throughout the process to ensure you get the results you’re looking for. To achieve the best outcome, Dr. Alidadi partners with an experienced local oral surgeon who places the implant. Once the implant is stable, Dr. Alidadi places the natural-looking replacement tooth or teeth. Implants are placed when teeth are already missing, or after extractions. With today’s advancements in dental procedures and technology, almost anyone can receive implants. If there is insufficient bone in the jaw to support an implant, bone grafting may be necessary. If any preliminary treatments are needed, Dr. Alidadi will go over these in your consultation and exam. A natural tooth (left side), compared to a dental implant and crown (right side). A dental implant is made of titanium, a biocompatible metal. Titanium resists corrosion and can withstand the strong forces of chewing and biting. It is considered the “gold standard” among dentists when it comes to replacing missing or heavily damaged teeth. The implant is placed in your jawbone and acts as a replacement tooth root. An abutment is placed on the implant, and a high-quality porcelain crown is attached to the abutment. This complete unit is thoroughly stable and natural-looking. It’s comfortable, feels like a natural tooth and allows you to chew and smile with confidence. Gone are embarrassing gaps in your teeth. Now you’ll have a natural-looking tooth that’ll let you smile freely and will aid in continued good dental health. 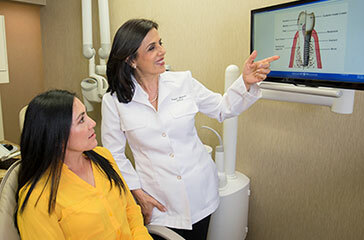 Dr. Alidadi will go over your 3D X-rays and answer all your questions about dental implants. Dr. Alidadi starts with a comprehensive oral exam, which includes digital X-rays and a dental 3D CT scan. The images produced by the scanner provide sharp, 3D 360-degree views of your teeth, jawbone, sinuses and surrounding structures. 3D imaging shows details that are not visible with traditional X-rays. 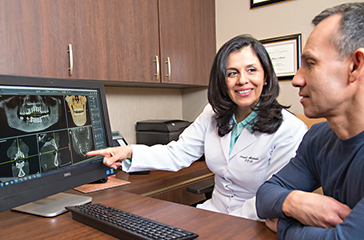 Using the digital images, Dr. Alidadi will precisely plan your implant treatment and new crown. This treatment plan includes any procedure needed before your implants are placed. 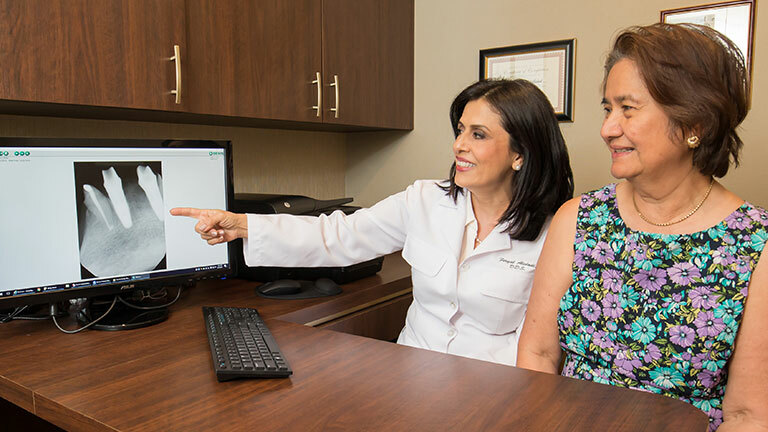 Dr. Alidadi will thoroughly explain the implant procedure to you and answer all of your questions, so you will know what to expect each step of the way. Dr. Alidadi will ensure your new implant-supported tooth will look natural and be fully functional and long-lasting. Once your titanium implant is firmly integrated with your jaw bone, Dr. Alidadi places an abutment on the implant. She then attaches a high-quality porcelain crown to the abutment. The crown is natural-looking, fully functional and extremely durable. It will feel just like a natural tooth. Implants fill in unsightly gaps in your smile. Implants deter bone loss that occurs when a tooth is lost. The implant fuses with the bone and stimulates bone growth. Implants allow you to chew and exert pressure, just like with natural teeth. Implants are longer lasting and more stable than other replacements for missing teeth, such as bridges or partial dentures. Removable dentures and fixed bridges usually need to be replaced every seven to fifteen years. Dental implants can last a lifetime, if properly cared for. Implants can be used to add stability to your dentures. If you currently have dentures, Dr. Alidadi can place a few implants with snaps. She will fit your dentures with special pieces that attach to the snaps. With this stabilization, your dentures will not slip and you will have increased chewing power. Dr. Alidadi can place four to six implants in each dental arch for more complete denture stabilization. Implant-supported bridges are the longest-lasting and healthiest bridge option for replacing missing teeth. There is no cutting down of healthy teeth, the implants help to maintain bone density, and the bridge is permanently fixed to the implants. An implant-supported bridge is a good option when you have missing teeth, or are going to have teeth extracted. Implant-supported bridges can be an economical solution for replacing many missing teeth in a row. If you have three to four missing teeth, for example, a bridge can be created by placing only two implants and using them to anchor that bridge.